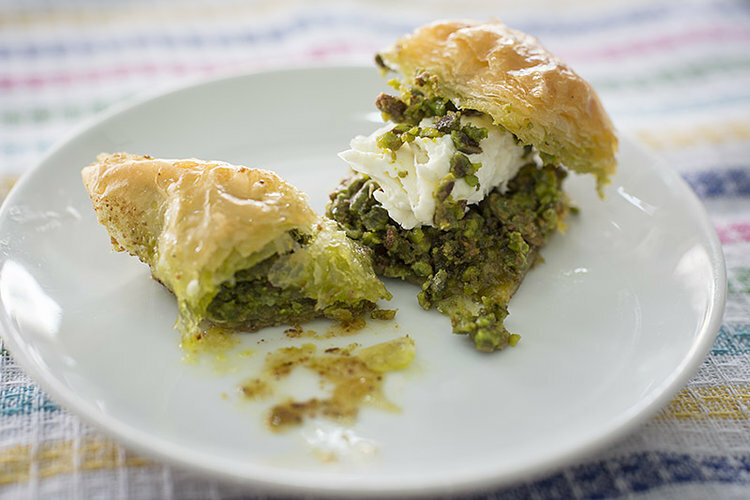 A look into the fascinating world of Turkish cuisine, from late night pilaf carts to buttery phyllo pastries. Before we proceed, it’s important to clarify that this Tumblr is not just photos of people eating Turkey. 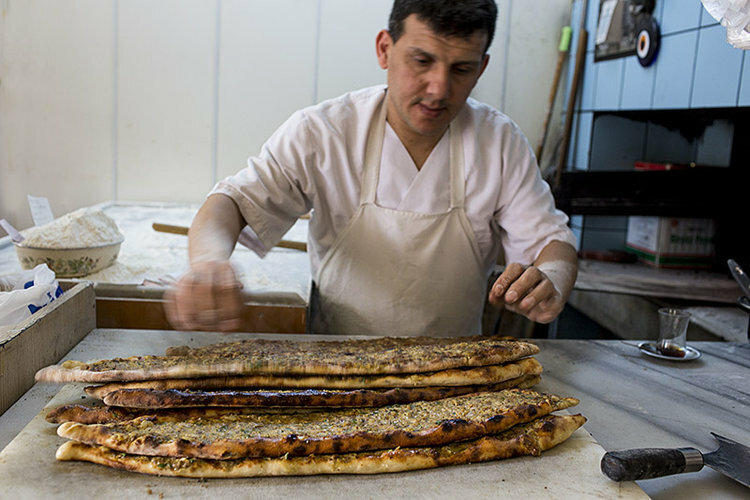 Eating Turkey is a sprawling display of Turkish cuisine, with snapshots of Turkish breakfast staples, late-night pilaf carts, and early morning farmers markets. The blog is run by food and travel writer Robyn Eckhardt and seasoned photographer David Hagerman. Together, the superduo have contributed to New York Times, Saveur, Food & Wine, Afar, and SBS Feast, among a multitude of other food, drink, and travel publications. They are based in Southeast Asia and spend at least five months each year in Turkey. 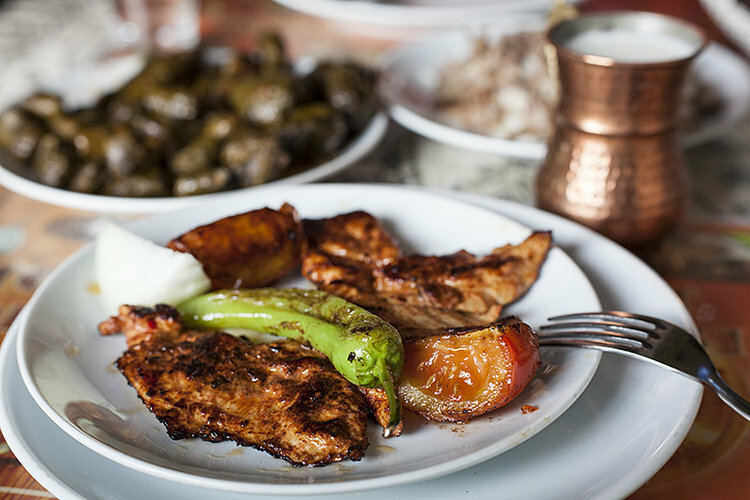 In a blogosphere that is fettered with abroad college students’ wide-eyed travel blogs and amateur food photos, Eating Turkey sets itself apart with immaculate coverage of foreign culture and cuisine. 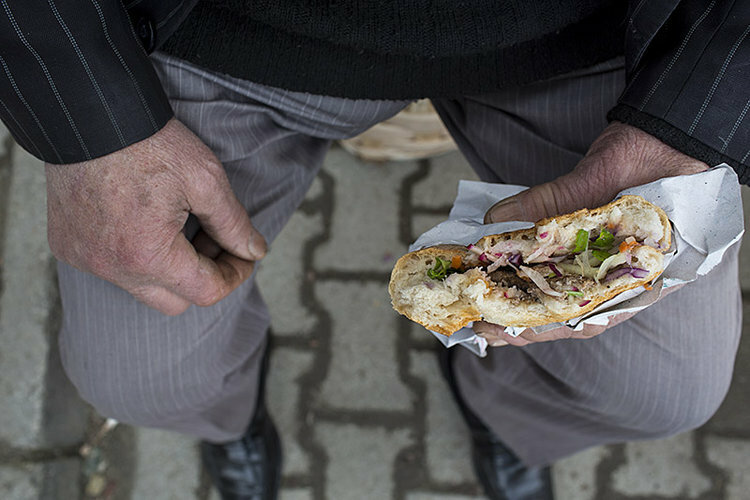 Click through the gallery above for a look at Eckhardt and Hagerman’s notes and images from Istanbul and beyond. All photos courtesy of EatingTurkey.tumblr.com. 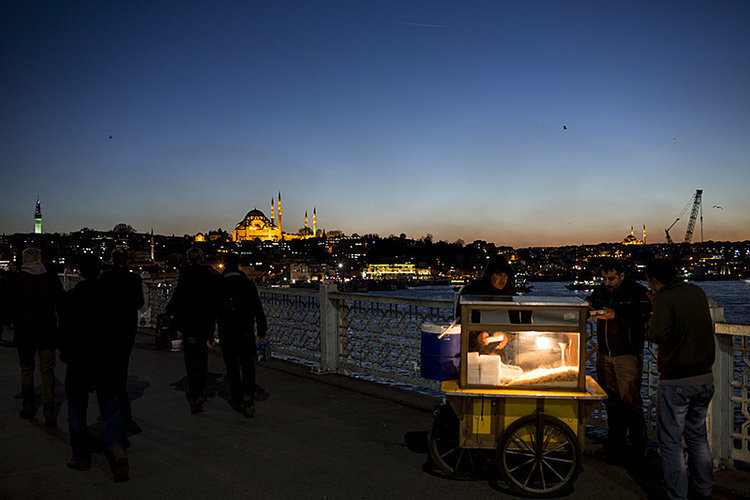 A late-night Nohutlu Pilav (rice and chickpea pilaf, eaten with chicken) cart on the Galata Bridge, Istanbul, Turkey. 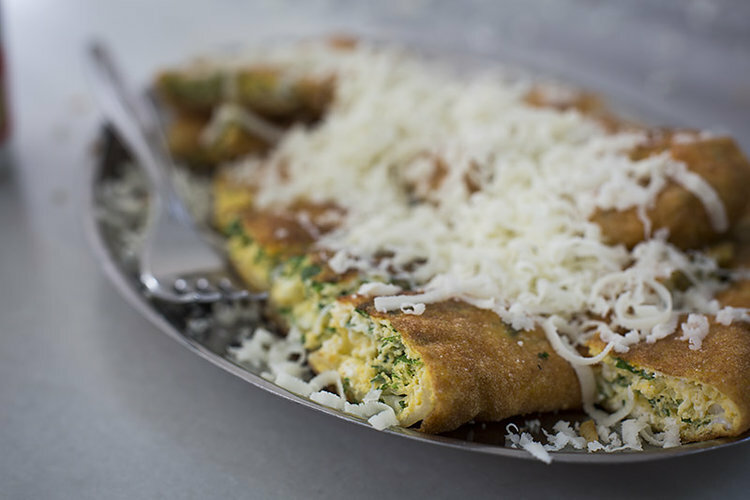 Katmer, a Turkish breakfast offering consisting of "a dough of flour, water and salt rolled paper thin and then thrown roti-style, spread with a beaten egg, herbs and çökelek (crumbly cheese made with whey left over from making yogurt), folded over and griddled till crisp." 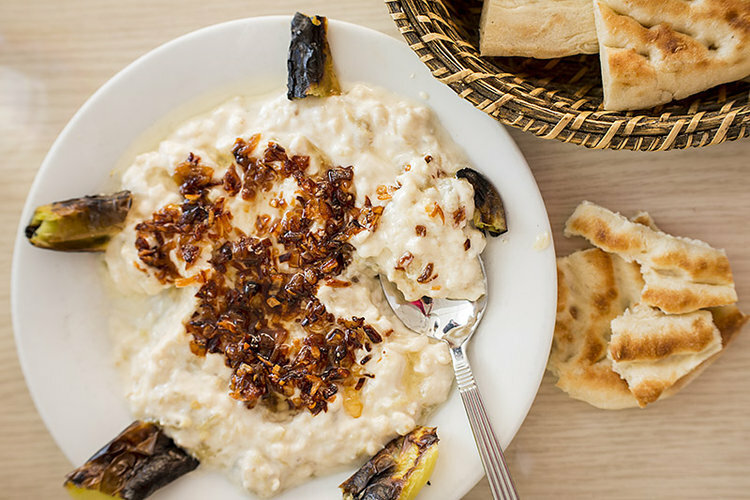 Meyir: "goat milk yogurt on the edge of effervescence, studded with bits of smoky grilled eggplant flesh and chewy kernels of cracked wheat. Another layer of smokiness added by chopped onions coaxed in lots of butter to a crispy caramel state. Roasted long green chilies on the side." 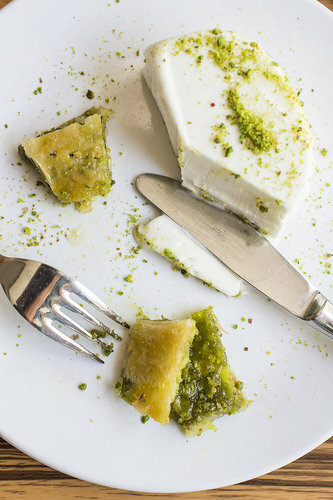 Karamanmaras Katmer with Dondurma: "a paper-thin yufka (or phyllo) pastry layered with pistachios and butter that’s baked and drizzled with sugar syrup." Köfte: "beef, grilled and stuffed into a sturdy loaf with tomatoes, lettuce, flat-leaf parsley, onion and thinnest shavings of red cabbage"
Menemen, a Turkish breakfast staple of egg, onion, tomato, green pepper, and spices. 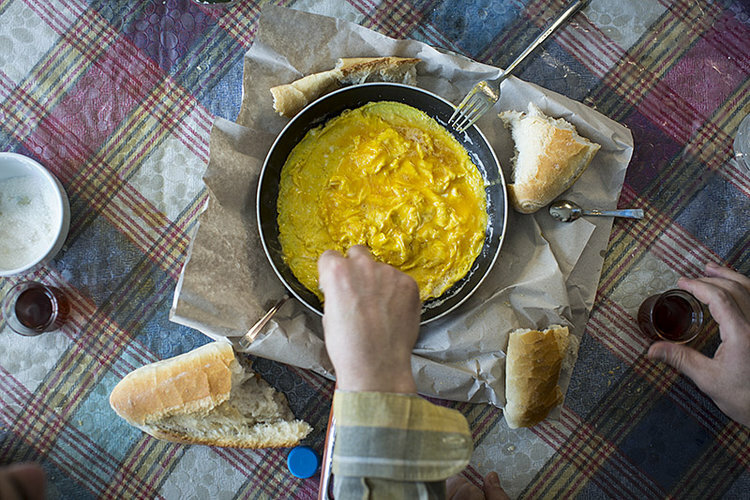 Köy Yumurtası, the classic Turkish breakfast of eggs and bread. 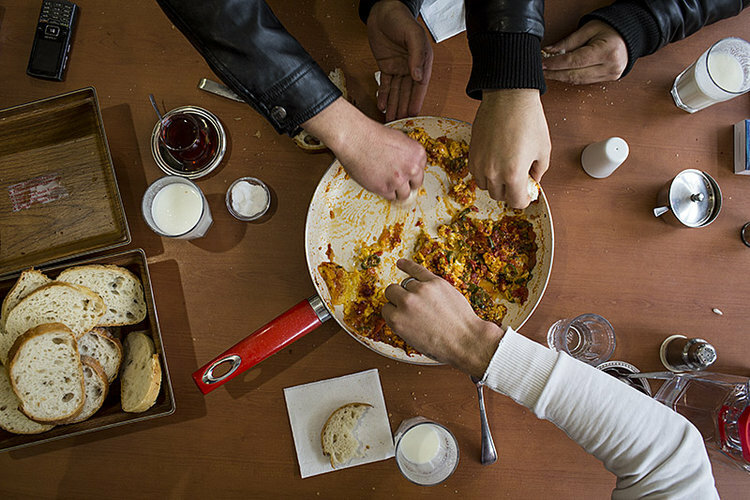 Açık Kaşarlı: "an open-faced dough boat oozing lightly sharp cheddar-like kaşar, its blistered crust glistening with a slick of melted butter." 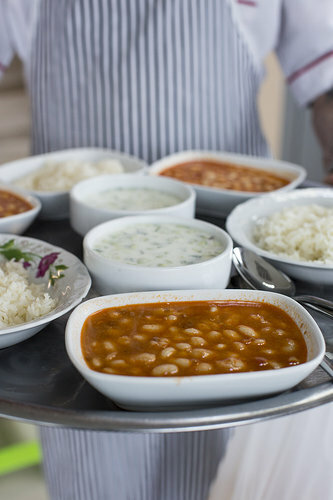 Etli Kuru Fasulye: "(dried white beans in tomato-red pepper sauce with just a touch of minced beef), buttery rice pilaf and a fantastically refreshing cacik made with from-the-village yogurt, cucumber and fresh dill, mint and parsley." 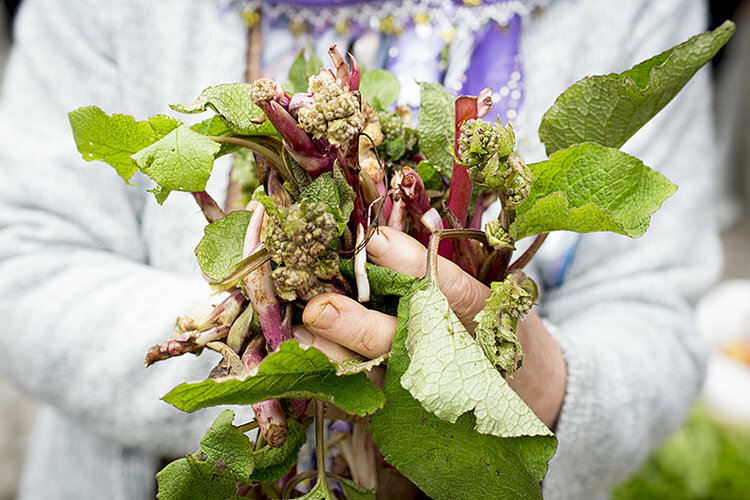 Zılbıt: "strange looking thick-stemmed leafy vegetable that’s foraged during the winter from the region’s many forests." 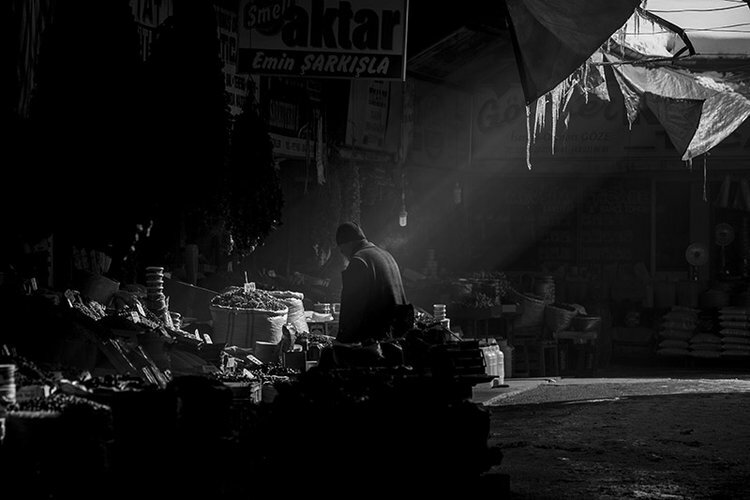 Early morning markets in Sivas, Turkey. 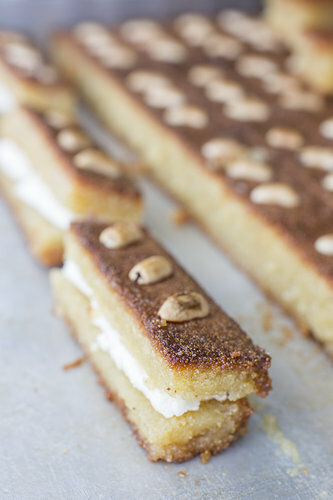 Şambal: "semolina, almond flour and milk doused with just enough sugar syrup to hold them together." 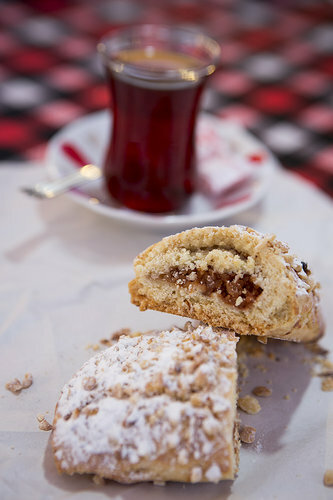 The classic Turkish dessert pastry, baklava.